If when entering your comparative balances you need a new nominal account to post to, you can create a nominal account. You can also change the name and code for a nominal account you’ve created by clicking its row (or if it’s a standard code, you can change the name). 1. Click Enter comparative trial balance. A row exists for every nominal account, listed in ascending code order. Use the Tab key to move from one cell to the next, or Enter to move down the list. If you don’t see the option Enter comparative trial balance, check that you haven’t previously indicated that this set of accounts is a first period. Click Set of Accounts Options > Period Options. If the First period (no comparative period) check box is selected, you’ve indicated that no comparative is needed. Clear this check box if you want to add a comparative > Save > Trial Balance. Balances round to the nearest whole number, so 100.58 will round to 101. However, bankers rounding is applied so numbers ending in 0.5 will round to the nearest even whole number. For example, whilst 100.58 will round to 101, 100.50 will round to 100 (i.e. the nearest even whole number to 100.50). Balances are supported up to £999,999,999.00. 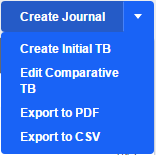 A journal is created when you save your comparative trial balance. To see it click Trial Balance > Journals. 1. Trial Balance > Create Journal drop-down menu > Edit Comparative TB. Alternatively: Trial Balance > Journals > click Comparative Trial Balance from the list of journals. 2. A row exists for every nominal account, listed in ascending order. Use the Tab key to move from one cell to the next, or Enter to move down the list. Trial balance > Journals > click the delete button beside Comparative trial balance > Delete.